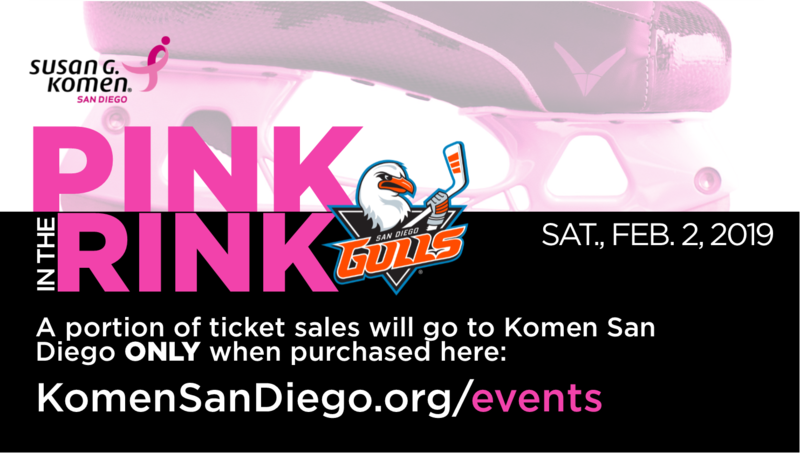 The San Diego Gulls are excited to welcome friends and families from Susan G. Komen® San Diego to the 4th Annual Pink in the Rink! IMPORTANT: $8 from each ticket will be donated to Susan G. Komen San Diego ONLY when purchased through Komen San Diego. The online ticket link is now closed. If you would still like to purchase tickets, please contact Jeremiah Tuhn with the San Diego Gulls by email (jtuhn@sandiegogulls.com) or phone (619-359-4723). Tickets sold on game day at the box office will not benefit Susan G. Komen San Diego. 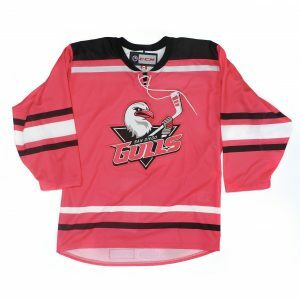 During the game, the Gulls players will be sporting these one-of-a-kind Pink in the Rink game day jerseys. All of the jerseys will auctioned off through DASH Auctions on Saturday, February 2nd throughout the entire day with 100% of the proceeds benefiting Susan G. Komen San Diego. The San Diego Gulls will be offering many fun and exciting things throughout the evening, including a silent auction featuring one-of-a-kind Pink in the Rink Game Jerseys! 100% of the proceeds from the silent auction will benefit Komen San Diego! Tickets can be purchased online until 1/31/19 at 7:00pm. When purchasing through FEVO, you will immediately get a confirmation email of your purchase and a unique link that you can share with family, friends and colleagues. If anyone purchases a ticket through your special link, FEVO will know to place your seats together. On 2/1/19, FEVO will issue you a final email with your electronic email. If you have any additional questions, please contact our Events and Volunteer Manager, Gabby Murrieta or call 858-573-2760 x105.